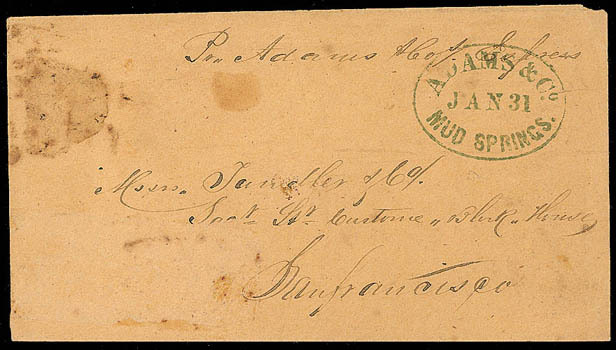 Adams & Co's, Express, Michigan Bluff, clear strike of double oval handstamp with matching "Paid" in circle alongside, on docketed September 9, 1853 oversized cover to Sacramento City, Cal. ; few cover tears at top, otherwise Very Fine, very scarce. Adams & Co., Mud Springs, blue oval date stamp on cover to San Francisco with manuscript endorsement "Per Adams & Co's Express", trivial cover stain at left, otherwise Very Fine, a rare usage of this Adams Mud Springs date stamp. 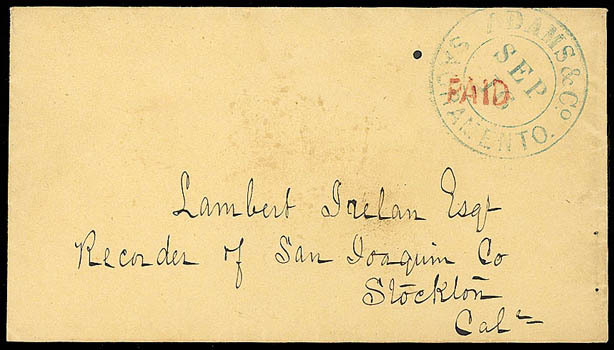 Adams & Co., Sacramento, Sep 16, blue double cds on fresh yellow envelope to Stockton, Cal., with additional red "Paid" handstamp, Very Fine, a rare and attractive handstamp combination. 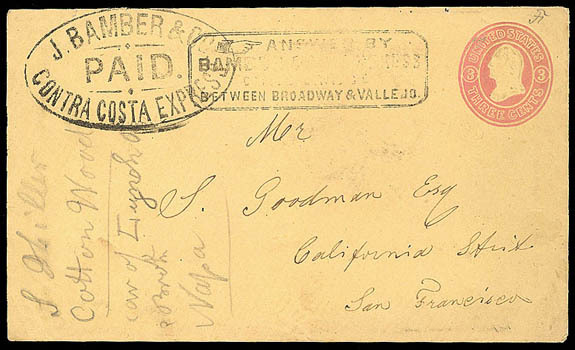 Alta Express Company, San Francisco, red oval handstamp on cover addressed to San Francisco, some contemporary notations, Very Fine, a scarce early usage, accompanied by contemporary newspaper clipping for the express. 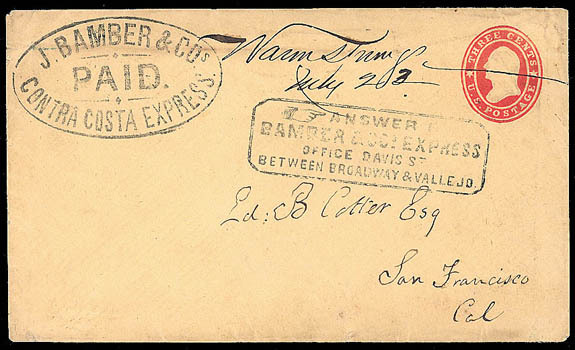 Bamber & Co.'s Contra Costa Express, bold oval handstamp on 1861, 3¢ pink entire to San Francisco with "Answer By Bamber & Co.'s Express…" boxed handstamp, small pencil initial at top right corner thought to be the Wells, Fargo & Co. agent's, Very Fine. 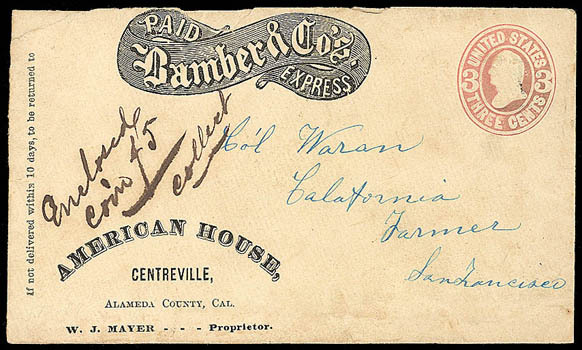 Bamber & Co.'s Contra Costa Express, fancy scroll frank on 3¢ pink entire to San Francisco with printed corner card of the "American House/Centreville/Alameda County, Cal." at lower left, endorsed "Enclosed Coin $5/Collect", small cover tears at top, F.-V.F. 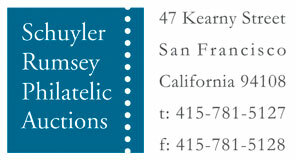 and attractive. 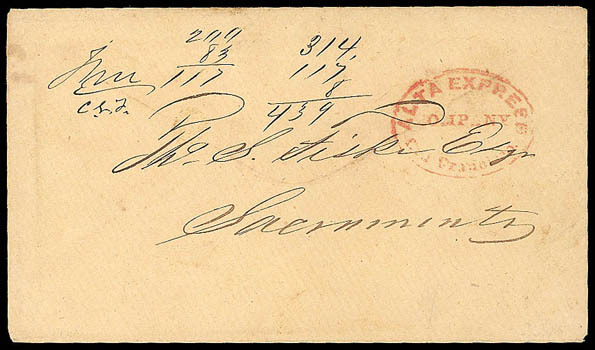 J. Bamber & Co.'s Contra Costa Express, Paid, oval handstamped frank on 3¢ Star Die entire with manuscript "Warm Springs, July 23" (1861) alongside the indicia, addressed to San Francisco with boxed "Answer by…" Bamber handstamp., Very Fine, the nicer of two similar known covers from Warm Springs. 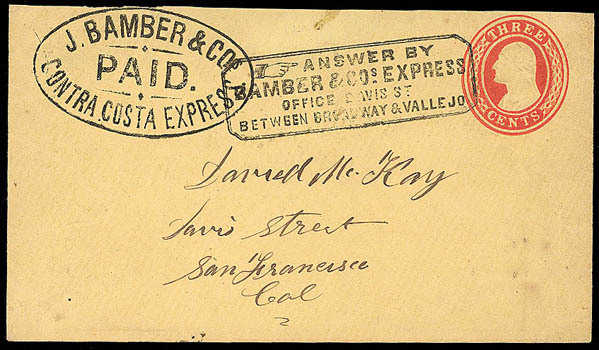 Bamber & Co.'s Contra Costa Express, Paid, bold oval handstamp on 3¢ Nesbitt entire to San Francisco, with boxed "Answer By Bamber & Cos. Express…" directive ad handstamp; missing backflap, Extremely Fine strikes. 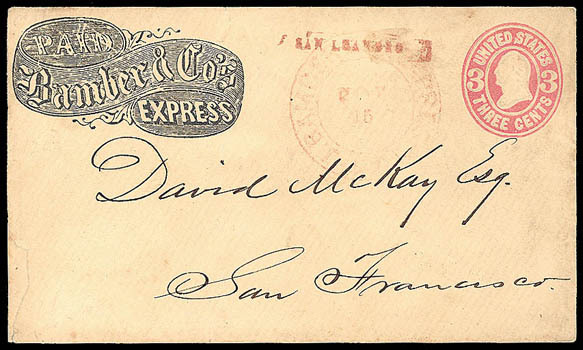 Bamber & Co.'s Express, black scroll frank on 1864, 3¢ pink entire to San Francisco, with red straight line "San Leandro" origin handstamp and "Bamber & Co.'s Express, S.F., Nov 15" receiving cds in red; small cover opening tear at lower left, Very Fine. 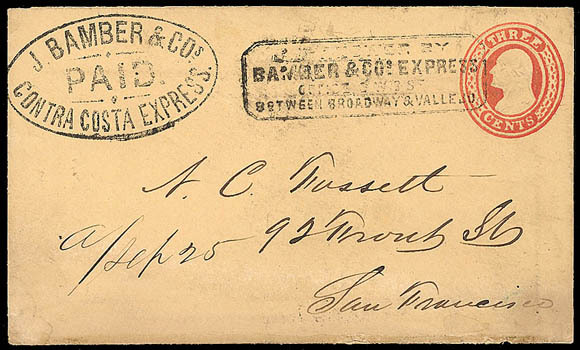 Bamber & Co.'s, Contra Costa Express, Paid, bold oval handstamp frank on 1853, 3¢ Nesbitt entire to San Francisco, with matching "Answer By Bamber & Cos. Express…" with pointing hand directive box handstamp, original 1860 enclosure headed "Pacheco", Very Fine.